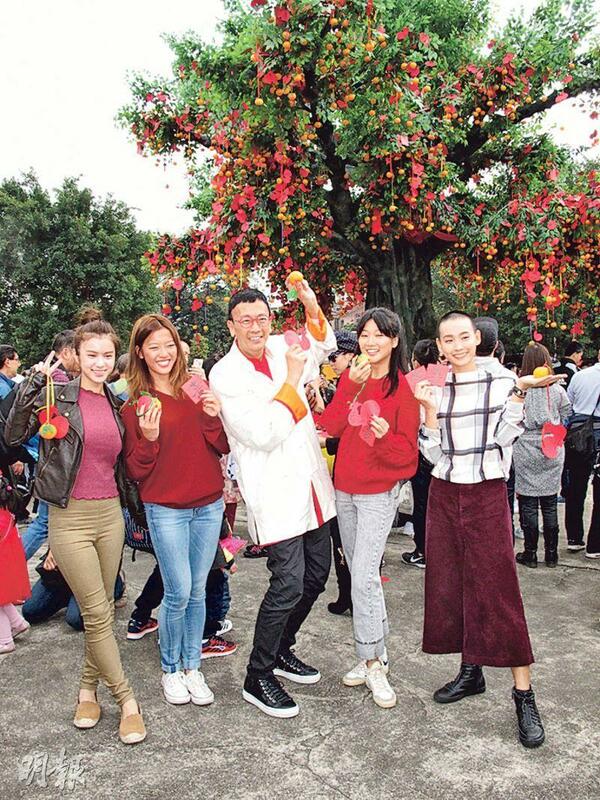 Lawrence Cheng Tan Shui yesterday led Larine Tang Yueping, Hedwig Tam Sin Yin, daughters Zaneta and Amanda Cheng to promote their film YUPPIE FANTASIA 3 (SIU NAM YUN JAU GEI 3 ji NG GA YAU HEI) at the wishing tree in Tai Po. Ah Tan said that while visiting on the Lunar New Year's Day, he received film company box office announcements. At first he was very nervous. He was very happy to learn in the end that the cinemas were sold out. He said, "From the Lunar 29th to the New Year's Day, the film had over 3 million over 3 days or over 1 million per day. With such a good performance for my first Lunar New Year film, I am very excited!" He also said that his on screen daughter Tang Yueping brought the film luck. Ah Tan said that he never thought about the box office, the most important was for the audience to have fun and good word of mouth. I hoped that the film would perform well and the boss would be pleased, then he would have a bonus. Has he considered a sequel? Ah Tan said to Tang Yueping, "She is a star now, I have to ask her if she would have any time to make it." Tang Yueping said, "When Brother Tan asks, I would work even for no salary."